As a Registered Dietitian Nutritionist and mom I have combined my expertise and my empathy for moms and their postpartum journey to create the HGG Postpartum Nutrition. 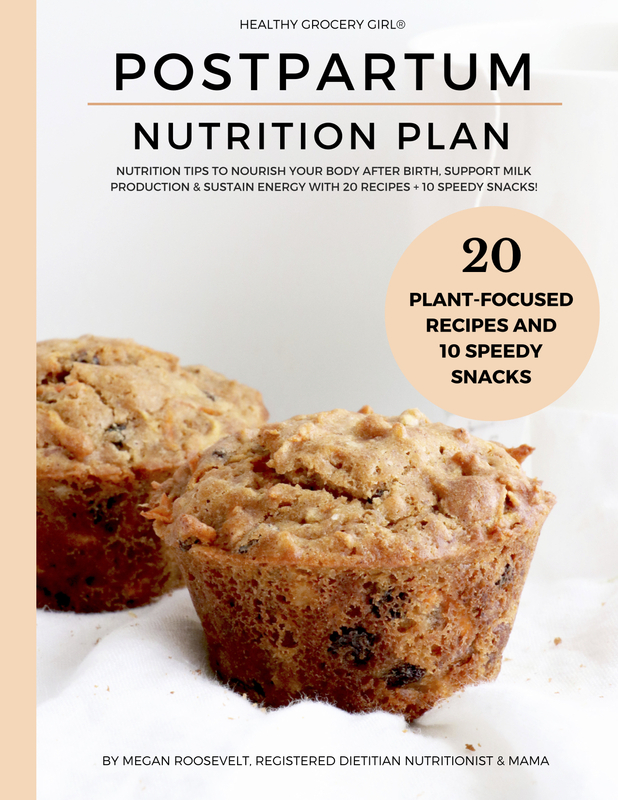 This plan includes nutrition tips to nourish your body after birth, support milk production and sustain energy levels with 20 plant-focused, gluten-free recipes and 10 speedy no recipe snacks you can eat with one hand! You can’t pour from an empty cup. Your little one needs a healthy and happy mama. Self-care is hard and somedays feels impossible as a mom. But this plan is an amazing tool and resource to help your nourish your body, fuel your days and remind you that you are not alone, and that you are doing a great job! INTRODUCTION: You Just Had A Baby! Great Job Mama! When is the best time to purchase this plan? This plan is perfect for mamas who are pregnant, postpartum or even if your baby is 15 years old! The recipes are designed to be simple and nourishing, perfect for all seasons of life. However, I do include nutrition tips and recipes with ingredients that specifically support new mamas. However, when you are pregnant would be the ideal time to meal prep for postpartum! Once baby comes there will be less time to read and meal prep. Purchase this plan now to meal prep and freeze meals and you’ve won half the battle of nourishing yourself postpartum! Is this plan only for new moms? While the nutrition tips and recipe ingredients are designed to support new moms, you can truly enjoy this content in any season of life. This plan includes recipes the whole family can enjoy whether you’re pregnant, just had a baby or your baby is 20 years old! Due to the nature of this plan being a digital download, all sales are final. Can I gift this plan to someone? Yes! Please email Aaron at Support@HealthyGroceryGirl.com to purchase a gift certificate. Do I receive a physical plan in the mail? Nope! This is a digital product. After purchase you will receive a PDF guide available to download and view on your desktop computer, phone or tablet. You can also print and have bound at your local print shop. All of the recipes are gluten-free, dairy-free, soy-free and predominately plant-based. Some of our recipes call for eggs and therefore some recipes are not vegan. However, we provide egg alternatives so that every recipe can be made vegan. Will this plan benefit me if I’m not breastfeeding? Absolutely! The primary goal of this Nutrition Plan is designed to nourish moms. If you are breastfeeding we offer tips and recipes that may support milk production. What if I have a dietary or recipe question before or after I purchase this plan? Please email support@HealthyGroceryGirl.com We are happy to answer your questions. You can also join the HGG Mama Facebook Group for support from Megan, the HGG Team & fellow HGG Mamas! How do I access this Nutrition Plan after purchase? You will receive an email receipt of purchase with a link to download your PDF plan. For HGG Members you can login to your account to view or download all HGG Nutrition Plans. To login click the login tab at the top of the website. If you cannot view or download your plan please contact us at support@healthygrocerygirl.com and we are happy to help! This page may contain affiliate links, which simply means that I earn a commission if you purchase through those links, thank you for your support! Please me know if you have any questions or feel free to read my disclosure policy.